Over the past 8 years there has been a revolution in our perception of the ways in which exposure to chemical carcinogens causes cell transformation and tumour induction. 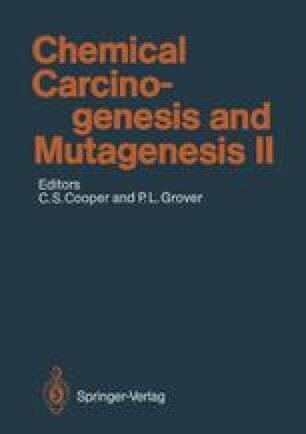 The recent exciting advances in this field are rooted in earlier observations that identified genetic material as the probable target during carcinogenesis. Boverii, who in 1914 noted frequent karyotypic abnormalities in tumour cells, is usually credited as the first person to recognise the potential importance of genetic changes in tumour development (reviewed in Strong 1949). More recently, the discovery for particular groups of chemicals of correlations between carcinogenicity and mutagenicity (McCann et al. 1975; McCann and Ames 1976) and between carcinogenicity and the extent of covalent binding of the cancer-causing chemicals to DNA (Brookes and Lawley 1964; Frei et al. 1978) provided important indirect support for the idea that DNA is the critical target during chemical carcinogenesis. This field of endeavour blossomed with the discovery that DNA from lines of chemically transformed cells could be used to transform a line of immortal NIH 3T3 mouse fibroblasts in DNA transfection experiments (Shih1 et al. 1979; Cooper et al. 1980), an observation that provided direct support for the concept that cell transformation may involve the generation of dominantly acting transforming genes (oncogenes) by mutation of particular normal cellular genes (proto-oncogenes). The fruits yielded by the DNA transfection procedure and by other techniques that are now used for detecting activated cellular genes form the subject matter of this chapter.